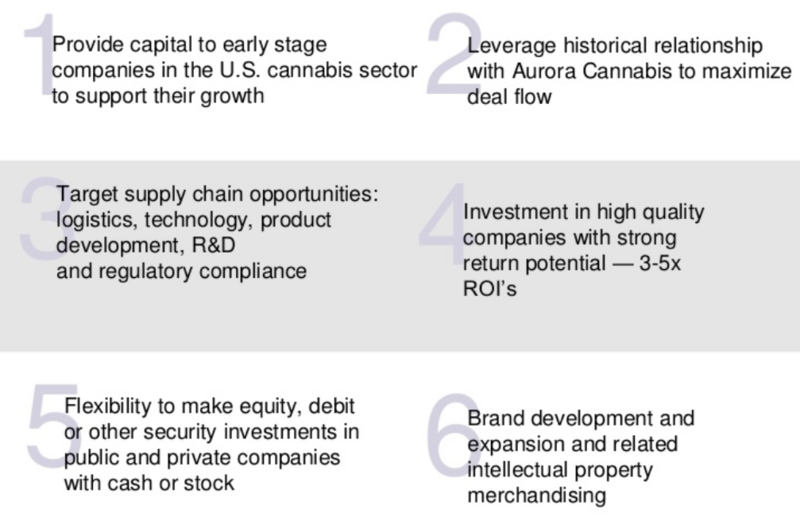 Aurora Cannabis, a preeminent global cannabis company based out of Toronto, Canada, created Australis Capital by way of a spin-out of its shareholders. Australis was created to take advantage of the fragmented and growing U.S. cannabis industry. Investments may include equity, debt or other securities of both public and private companies, financings in exchange for royalties or other distribution streams, and control share acquisitions. Investments will be reviewed on an ongoing basis to determine the appropriateness of their weighting within the overall portfolio to provide optimal returns and grow shareholder value. Australis adheres to stringent investment criteria and will focus on significant near- and mid-term high-quality opportunities with a steadfast commitment to governance and community. Members of the Board, Management have deep experience in highly regulated industries and knowledge of the U.S. cannabis industry. Together, they bring years of experience in regulatory compliance, public company governance, and operations. New Cannabis Ventures in partnership with due diligence platform 420Investor, is the definitive source for fact-based, data-driven, financial information and relevant company news for qualified publicly traded cannabis companies. NCV extracts and parses only the most important content. Information is provided “as is” and solely for informational purposes, not for trading or advice. Australis Capital is a client of NCV Media, LLC. Read our full disclaimer.